The poor guy’s just sitting there in a lawn chair, head down, hands in his lap, gloomy as the news. Behind him, a brilliant sunset over a sparkling lake casts his shadow toward the darkness. I don’t know his name. I don’t know his story. Or, as I sit here in my basement working well into the future, oblivious to the perfect fall day unfolding outside, maybe I do. 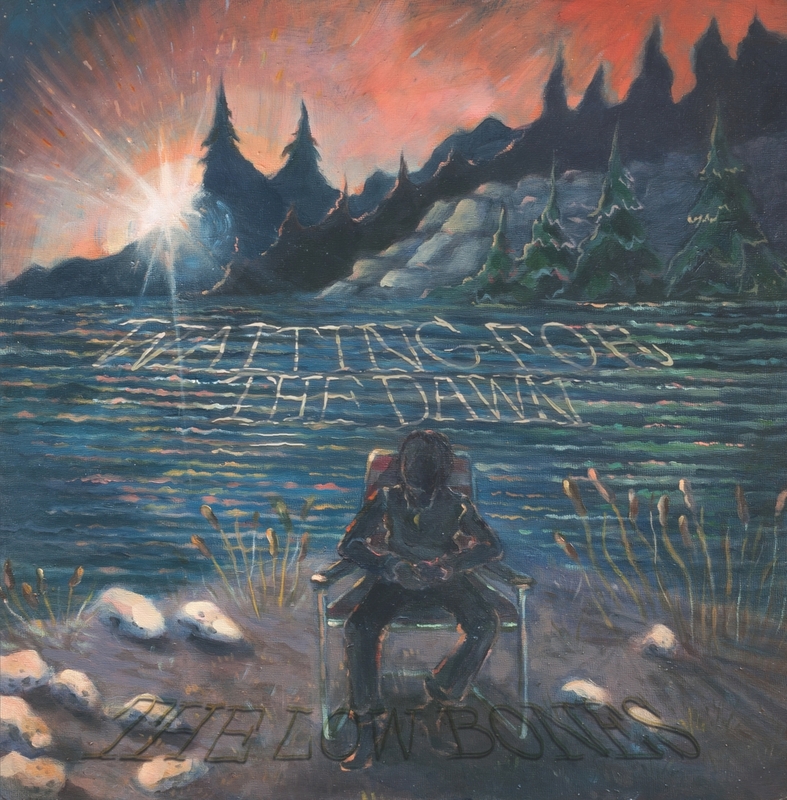 Hell, maybe I am that guy in the Amy Kuttab painting on the cover of the latest from the Low Bones, Waiting for the Dawn. Probably we’ve all been that guy at one point or another. The Low Bones put out Come Back Alone in 2010. With Waiting for the Dawn, Joel Roth has basically come back alone. Bass player (and co-songwriter) John McDonald split to chase new sounds. Drummer Jenni Lynn Nissila moved to Texas. Guitarist Jason Montgomery moved around, but played gigs when he could. And so as it goes for most bands, it went for the Low Bones. Roth was left to hang the name on shows he’d play around Portland as a duo or a trio with bassist Grant Law. He kept writing until he had a collection of songs he liked, until he had a record. “I wasn’t sure how I was going to do it, but I decided to book some studio time and see what panned out,” he said. We were sitting at the Lucky Lab and he was running through his story. His mother died when he was three. His father quickly remarried and decided to take his new family out on the open road. They loaded up what they needed, sold the rest, and spent a year driving around the country. “Ghost towns were huge for me,” he said. “Loved the Old West. Always loved westerns.” He graduated high school, went to Europe. He came home and decided to head west in search of the towns he saw in his head when he thought of that childhood trip. Like many later settlers, Roth came with a pal in a VW bus, though his friend split in Jackson Hole, Wyoming. “Girlfriend problems,” Roth said. He routed through Reno for a cup of coffee a $5 bet, and then headed north toward Portland. This was the early- to mid-1990s, and Roth got back into music. He spent a lot of time in front of the four-track and formed a band named 100 Percent Neck. “The name came from this old, mean man who lived across the street,” Roth said. “He always wore a neck brace and was just miserable. He hated everybody.” That band led to another, and then another. Some were strictly for fun. Some got out and gigged. One, the Turn Ups, got a song on Car Talk. Next came the Low Bones, and we know the ins and outs of that story. Roth took his new songs to Rob Stroup, who helped produce the album. Together, they drew up a plan, one that relied on one of Portland’s most important natural resources—friends who can play. Roth put together a roster loaded with talented players and perfectly matched their skills to the album’s 10 tracks. The payoff is in the way the music moves expertly—from dusty Robert Earl Keen-minded road songs to thrashing guitars that conjure up Chuck Prophet to enough classic rock to bring Tom Petty into the fray —with the record’s largely optimistic collection of stories. The title track, inspired by the 1987 Keanu Reeves movie River’s Edge isn’t exactly uplifting, not with its murder-down-by-the-river motif, but there’s light to be found in the rest of the songs. Whether that light is the sun rising or setting is what’s to be determined. The honky tonk dance led by the pedal steel guitar at the end of “That Girl of Mine” suggests that girl might be coming home to stay. “No Place to Be” is one portrait of a soul you might call lost, but isn’t necessarily. He knows where he is, and where he’s headed. It’s to the liquor store. It’s a tough world. You do what it takes sometimes. “Song for Santiago” feels more desperate. The music mixes the sweet and the psychotic; the lyrics paint a picture of someone who is high and then low and then wonders, “What’s the use?” But he’s not like the other thieves on the street. He’s not out to be used. He’s maintaining his dignity and at least some sense of self against the despair. “I do believe he’ll stand tall,” Roth sings. But believing is different than knowing. “Who knows where it’s going to wind up?” Roth says. “Which is the case in almost all these stories. The one thing these songs have in common is the open ending, which is life.” And life is what you make of it. “The Road” is either a perilous journey across a snowy mountain pass, or a picturesque winter scene. It all depends on your point of view. 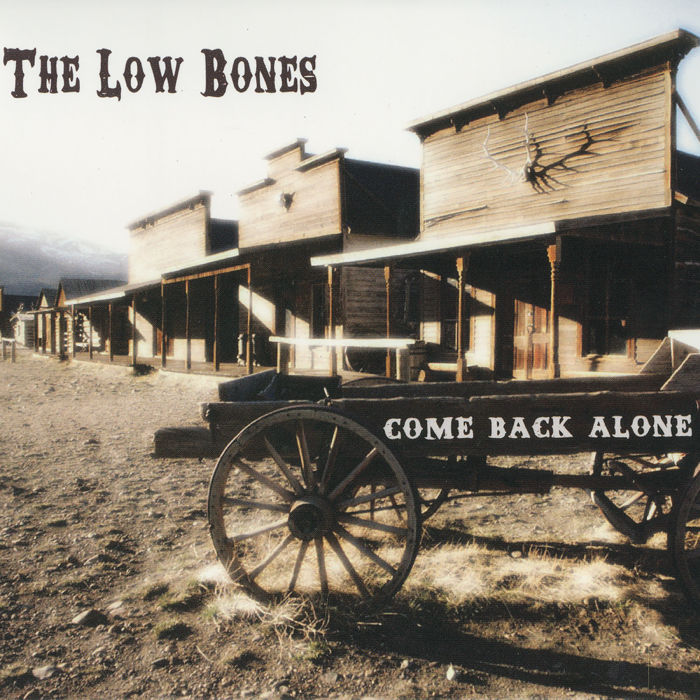 The first track from The Low Bones CD, Come Back Alone, bolts out of the barn with guitars and drums blazing away, like gunfighters at the OK Corral. As the disc spins (or does whatever MP3s do), song after song leaves you saying to yourself, “This is what roots-rock is all about!” Armed with more than a handful of classic influences, The Low Bones fire away straight and true from their arsenal, having learned from the best – from Gram Parsons to Johnny Cash to The Band and others – while hitting smack-dab on target, each song original and unique to the band. Regardless of the tempo or the key, their songs evoke the dusty barrooms and taverns where bands sang stories that made you want to listen, laugh, cry and dance. No need to wax nostalgic, though, because The Low Bones and&nbsp;Come Back Alone are alive and rocking today. The Low Bones tell dusty tales of the old west, tall ones and true ones; bent, twisted but still running, with a bowlful of spaghetti-western guitar balanced on the running board and bouncing down a gravel road.